This is the first official concept art of the new Sino-Russian jumbo jet, which can seat up to 280 passengers (stretched versions can probably carry 350 passengers). China and Russia are taking their high tech relationship to the next level, as the preliminary design for their jumbo jet will be completed by July. The C929 will be China’s ever largest civilian aircraft, and Russia’s largest post-Cold War jetliner. Currently, Chinese presidents charter Air China (China’s flag carrier) Boeing 747s to take them aboard, such as this visit by then President Hu Jintao to Mexico in 2005. In the future, the C929 is likely to be the first aircraft to serve as a permanent airliner for China’s future leaders. China, Russia and some western suppliers are teaming up on a $20 billion project to replicate the success of Airbus and achieve a major breakthrough into the passenger jet market. The China-Russia Commercial Aircraft International Corporation Limited (CRAIC) 50-50 joint venture was launched on May 22, 2017 in Shanghai, targeting a 2025-2028 maiden flight and first delivery. It aims to take 10% of a market dominated by Boeing and Airbus of 9,100 widebodies over 20 years through 2035, with a plane 10-15% cheaper to run. Based in Shanghai where the assembly line will be located, CRAIC will oversee the programme : technology development, manufacturing, marketing, sales, customer services, and programme management. The fuselage will be aluminium, total investment will be $13-20 billion. Airbus is a European joint venture which took billions in funding to capture about 10-20% of the passenger jet market over the first twenty years before breaking through to get about 50% of the market. For 2023–45, UAC and Comac forecast a 7,000 widebodies demand for $1.5 trillion – an average of $214 million, their goal for first delivery is 2027. The 280 passengers capacity over 12,000 km is comparable to the Airbus A330-900 but with a nine-abreast economy seating, the shrink would seat 230 while the stretch 320. Major suppliers will be picked among 169 companies by the end of 2018, as detailed design should be completed and a joint engineering center in Moscow with a branch in Shanghai will oversee development, employing around 100 engineers from both countries. Comac’s will be in charge of the fuselage sections, horizontal and vertical stabilizers, wing fairings, nose cone and landing gear; UAC will develop the composite wing, wing flap systems, engine pylons and main landing gear, with Chinese manufacture if it is cheaper. According to COMAC. 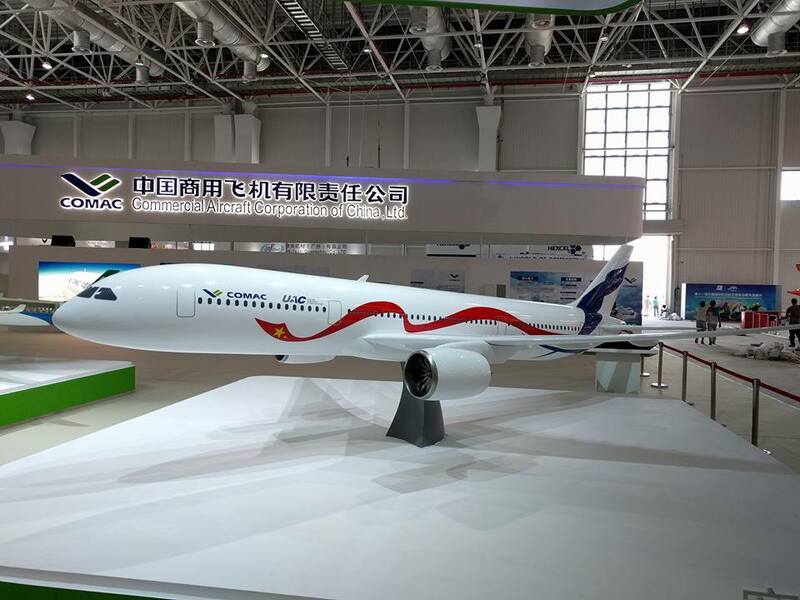 China will design and make the fuselage of the C929, while Russia will design the wings of the wide-body passenger aircraft, which is currently under development. China and Russia will each take half of the work, and send design staff for exchange visits on a non-scheduled basis. Although the main design center is in Russia, Shanghai will also have its own design office. China could see the joint venture involving joint financial investments, rather than an intellectual property sale, as Russia wants with the research and development center in Moscow and the aircraft manufacturing in Shanghai. It will be named CR 929 (CR stands for China-Russia) and will come in three variants: the -500 will carry 250 passengers in three-classes with a range of 14,000 km (7,560 nmi), the -600 will have 280 seats and a range of 12,000 km (6,480 nmi) and the -700 will carry 320 over 10,000 km (5,400 nmi). Concept approval is slated for 2017, early configuration and preliminary design for 2018, design documentation for 2021, first flight for 2023 and introduction for 2025. It will be powered by a western engine at first before an indigenous power plant is developed between Russia’s United Engine Corporation and China’s AECC, to start testing in 2022 and be certificated in 2027. Suppliers should be selected by 2018 to mid-2019. A request for proposal for the propulsion system, including the engine and nacelle, have been issued on 21 December 2017, to be answered by 30 May 2018. 2017, October 27 –The Federal Aviation Administration (FAA) and the Civil Aviation Administration of China (CAAC) today announced the signing of an implementing agreement under the U.S. – China Bilateral Aviation Safety Agreement (BASA) recognizing each other’s regulatory systems with respect to the airworthiness of aviation products and articles.